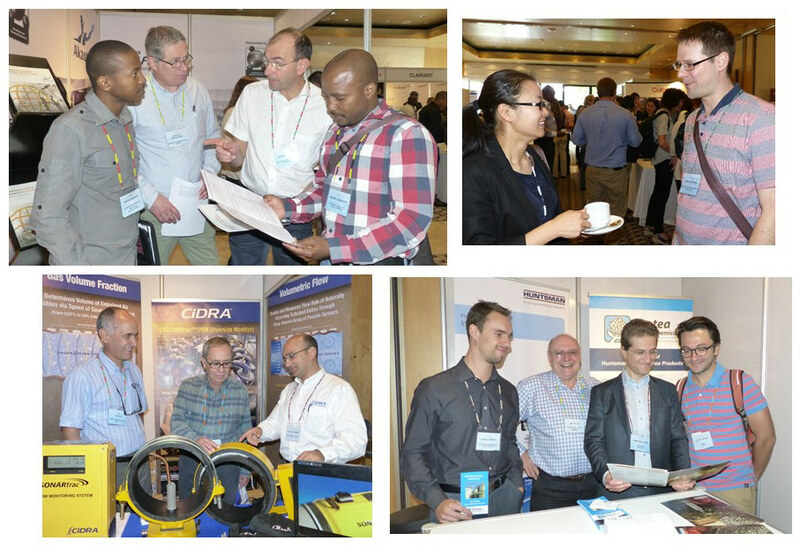 Flotation '15, the 7th in the MEI series, was held at the Vineyard Hotel, Cape Town, from November 16th to 19th, and, as always, comprised two discrete 2-day symposia on Fundamentals and Applications. A record 163 abstracts were submitted to the conference, of which 116 were selected for presentation, roughly equal numbers via oral and poster presentation. All the papers in the technical sessions, and most of the poster papers are available on flash drive from MEI Online, and selected papers from the event will be published next year in a special flotation issue of Minerals Engineering. I opened the conference this morning, welcoming the 241 delegates from 27 countries to a hot and sunny Cape Town. 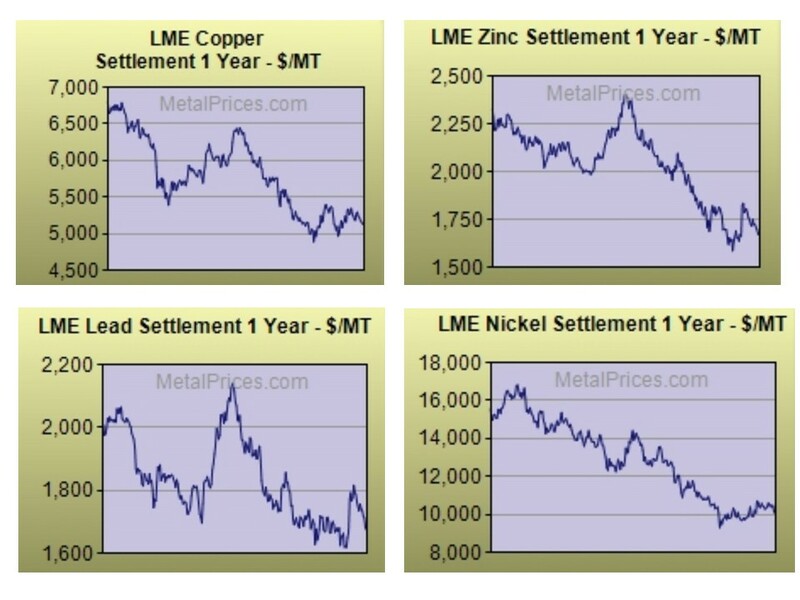 The minerals industry is still in a severely depressed state, and the slight decline in numbers since Flotation '13 with its 257 delegates, reflects the decrease in metal prices over the last few years, particularly the base metals which are so heavily dependent on flotation in their production. Despite this we have a record number of sponsors and exhibitors, so all is set for a very interesting and rewarding week. Following my brief comments, I had the great pleasure of presenting the 2014 MEI Award to Dr. Elizabeth Whiteman of Xstrata Process Support, Canada (posting of 16th November), after which I introduced one of our consultants, McGill University's Prof. Jim Finch, who set the scene as to what to look out for over the next few days. The conference then got underway with an interesting opening keynote lecture from Prof. Jan Cilliers, of Imperial College, UK, who asked "what have models and measurements ever done for us?" He showed that advances in theory and experiment take some time to move from the laboratory to the literature and on to the plant. It is also clear that while some advances have made a significant impact on industrial flotation, there is still much potential for further application. Currently, advances in macro- and high-speed photography allow observation of bubble-particle interactions never seen before. These images and videos are compared with 3-D physical visualisations to understand the underlying mechanisms. These new measurements and their interpretation are forcing us to question long-held assumptions on particle and bubble behaviour in flotation, attachment and detachment and bubble film failure. Unfortunately Jan experienced a few problems with the audio-visual aids, for which we apologise, but this did not detract from a fine presentation. The physics of particles and bubbles in flotation was the theme of the seven papers in the morning session (see Timetable), following Jan's keynote, with presentations from Turkey, Germany, South Africa, Canada and Finland. Positron emission particle tracking (PEPT) is becoming important in tracking the flow patterns of particles and bubbles in flotation cells, and the main players in this field, the Universities of Cape Town and Birmingham (UK), Imperial College and McGill University were involved with three of the morning papers. The morning session was broken by a long coffee break in the exhibition area, which gave delegates time to view the 30 posters on display and to take a first look at the 27 exhibit booths. The seven papers in the afternoon session included three on flotation kinetics, including an interesting collaborative effort between Canada's McGill University and Chile's Santa Maria University, comparing the predictability of kinetic models with the aim of contributing to the understanding of the flotation process. The models studied included single rate constant, distributed rate constants (viz. rectangular and Gamma distributions) and a novel approach based on fractional calculus. Graeme Jameson, of the University of Newcastle, Australia, presented a very topical paper on coarse particle flotation, which is attracting a great deal of interest because of its possible application in comminution circuits, scalping off coarse particles and hence reducing the load on the circuit and the corresponding energy consumption. Mechanical flotation cells are not suitable to float particles coarser than a certain size, as the turbulence in the cell is sufficient to destruct the bubble-particle aggregates. Graeme described how a fluidized bed is an alternative medium to keep the coarse particles in suspension, due to the relatively quiescent environment it provides. It was good to see Prof Jameson back in Cape Town. He missed Flotation '13 due to personal circumstances, the only one of the seven in the series that he was unable to attend. Last month he received Australia's most prestigious science award, the Prime Minister's Prize for Innovation, for the development of his eponymous flotation cell, considered by many to be the nation's biggest export earner in the last 25 years (posting of 21st October). Two papers from South Africa and France brought the day's sessions to an end before we adjourned to the lovely Vineyard Gardens for the first of the 'Happy Hours', a great way to relax and discuss the day's events (see also posting of 19th November). Yesterday's sessions were all about the physics of flotation, this morning it was the turn of chemistry, particularly flotation reagents. The session got underway with a keynote lecture from Prof. Janusz Laskowski, of the University of British Columbia, and the 2008 recipient of the IMPC Lifetime Achievement Award (MEI Online). He showed that a large number of minerals exhibit anisotropic surface properties. The presence of anisotropic gangue minerals in flotation circuits strongly affects the flotation process. This effect results from the ability of such fine particles to form slime coatings on the surface of valuable minerals, but also from the effect of fine anisotropic particles on rheological properties of the flotation pulp. Following the keynote, seven papers dealing with collectors, depressants and frothers took us to the lunch break. The last paper of the morning, on an electrochemical viewpoint of the flotation of the major copper sulphide minerals, a collaborative effort between Canada's Xstrata Process Support, and the University of Queensland, set the scene for the afternoon session, which focussed on the flotation of copper and copper-molybdenum ores. During the morning coffee break I called in to see Yang Zhiyong, President of our Chinese exhibitor, Shenyang Florrea Chemicals, China's ISO9001 certified leading manufacturer of flotation reagents, who were also at Flotation '13. Making its debut at an MEI conference is Ugur Seluloz Kimya, a Turkish manufacturer of the organic flotation depressant carboxymethyl cellulose. Pictured talking to MEI's Amanda are sales and marketing managers Ozgur Akoglu and Kaan Kimya. Dr. Ben Tordoff, head of mining & geoscience at ZEISS, presented a lunchtime session on recent advances in quantitative automated mineralogy, which covered a number of applications from mineral exploration to processing. The talk was well attended, particularly by academic delegates. Ben says that ZEISS is proud to be a sponsor of the conference due to the high quality of attendees and the structure of the events enabling significant interaction between exhibitors and delegates and he looks forward to Comminution '16 and Process Mineralogy '17 for which Zeiss are also sponsors. Water and energy are critical variables to the mining industry, particularly for operations situated on desert areas. A number of flotation plants around the world increasingly use sea water due to the depletion of available fresh water. The three final papers of the day, from Chile and Japan, discussed the use of seawater in flotation, particularly in relation to the problems caused in Cu-Mo separation. A fairly early finish gave everyone chance to relax before the coaches took us to nearby Kirstenbosch Botanical Gardens for the conference dinner (see posting of 17th November for more photos). MEI's Jon opened the Applications Symposium this morning, welcoming the 14 delegates who had registered only for these two days. The symposium then got off to a fine start with a keynote lecture from Dr. Nag Nagaraj of Cytec Industries, USA. Cytec is one of the oldest manufacturers of flotation chemicals and the company celebrates its centenary this year. 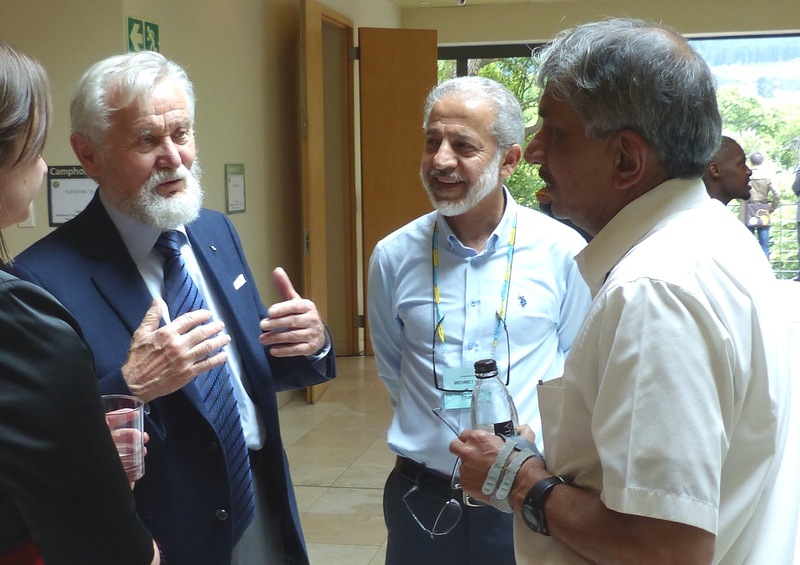 Nag discussed how the history of mineral flotation is a record of over a century of impressive innovations, especially in the development of flotation chemistry and chemicals. He emphasised the major innovations that have directed progress on this subject, especially those innovations that have positively impacted industrial scale applications. As in many other technology areas, flotation chemistry research and development have reached a plateau in the face of mounting industry challenges related to water and energy consumption, decline in the ore quality, and environmental aspects. Breaking out of this plateau will require several necessary steps, including more detailed, holistic understanding of practical systems, development of novel technologies and chemical schemes, and finally adoption by mineral processing practitioners. Success of developing novel technologies will be greatly improved when we can confront the chemical complexity in flotation systems. This in itself is one of the grand challenges in the emerging period and Nag outlined some directions to achieve this goal. Following Nag's excellent overview of flotation reagents, Jacques Bezuidenhout of Clariant, Germany showed how Clariant collectors can be used as alternatives to xanthate collectors in traditional sulphide flotation applications. Xanthates, first used in flotation in 1924, are reported to be the most widely used of the thiol collectors. They are therefore widely considered to be the most important collectors for sulphide mineral flotation applications. It is nevertheless Clariant’s experience that there is an increasingly strong push against using xanthate collectors in both new and existing flotation plants. Clariant Mining Solutions, in order to address this unmet need, has therefore developed a series of liquid collectors, soluble in water, which are able to completely replace various xanthate collector types in practice. The overall performance of these newly developed collectors against xanthate collectors, on a number of copper ores, was discussed. 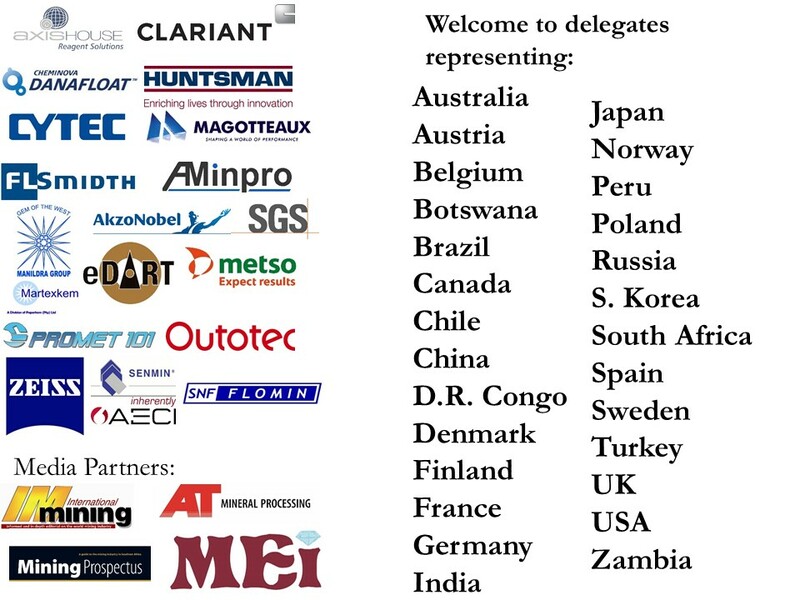 Chris Greet of Magotteaux Australia is a regular not only at the flotation conferences, but also at MEI's comminution conferences, and Magotteaux is a regular sponsor of both series of conferences. Chris presented a paper this morning on continuous, real time pulp chemistry measurements and what they tell us about metallurgical performance, all part of Magotteaux's holistic approach to mineral processing. In their exhibition booth they are promoting Chemillurgy (chemistry-milling-metallurgy) a new concept created by Magotteaux for mining customers. It consists in fusing different expertise, including pulp and surface chemistry, grinding efficiency and wear mechanisms, but these can be complemented by others if required. The target is to help customers boost concentrator performance by using different levers such as best-suited grinding media, mill liners, adapting milling parameters, reducing reagents consumption, improving pulp chemistry, mill-monitoring and security of supplies. We expect to hear more of this at Comminution '16. Following the break there were papers from Australia and Norway on the effects of clay minerals on flotation, the influence of collector-frother and collector-depressant blends, from Canada and China respectively, and a final paper from Chile which developed the theme of the use of sea-water in copper-molybdenum separation, highlighted in the Fundamentals Symposium. Ricardo Jeldres of CSIRO, Chile discussed the practical problems of using seawater. One of them is that at the pH needed to depress pyrite, ie pH >11, strong Mo depression take place which is mainly due to Mg precipitation. Further the buffer effect of seawater leads to excessive amounts of lime being needed, the Ca ions also having a detrimental effect on the quality of concentrate. Therefore new pyrite depressants that can be used at low pH (less than 9) are needed for sea-water separations. 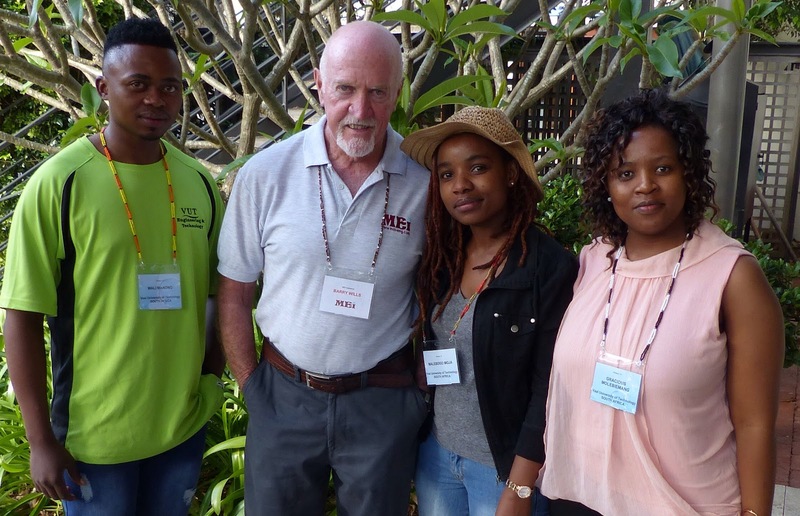 Adam Jordens of McGill University described work on the beneficiation of the Nechalacho rare earth deposit. MEI Award winner Elizabeth Whiteman discussed a practical process mineralogy approach to advancing the flowsheet for the Kamoa Project and Tom Leistner of Helmholtz-Institute Freiberg for Resource Technology, Germany described an investigation into the recovery of ultrafine cassiterite from tailings using oil-assisted flotation. After the coffee break Pierre Hofmeyr of IMP, South Africa, described the development of an automated sample transport system for mining flotation plants, whereby slurry samples are transported rapidly by compressed air up to 150 metres to where they are required. This speeds up obtaining analytical data, saves on labour costs and reduces errors, such as sample switching, which can easily be introduced when operators are involved. Although this system, using compressed air, was patented in the 1970s it has only recently been actively employed on a mining plant for the first time. As far as is known the system has only been used in Russia to date where the system installed is very successful. Flotation control incorporating Dynamic Matrix Control (DMC) with image analysis is a new and exciting concept which is currently being deployed at First Quantum Minerals Ltd's Kansanshi concentrator mixed cleaner circuit in Zambia. DMC has been chosen to handle the large degree of interaction and time delays typical of flotation systems, as described by Ryan Koorts of BlueESP, South Africa. Image analysis is incorporated via Stone Three Mining Solutions' image analysis engine which uses machine vision techniques to track key features of the flotation froth. Each cell in the bank is equipped with an optical camera system enabling the measurement of individual cell performance. Mark Ferra of REXA, USA then discussed how having a stable flotation cell pulp level is critical to effective copper recovery. He examined the significance of ensuring proper control of the froth level, with particular focus on the actuator modulating action of the dart valves in maintaining process consistency at a mine in Arizona, USA. The day ended with a paper from Nihan Arslan of First Quantum Minerals, Turkey, who described a multi-disciplinary approach with SGS Canada and South Africa to the optimization and control of a copper-zinc grinding and flotation circuit in Turkey. And then it was out into the late afternoon sunshine to enjoy the second of our 'happy hours'. On the way to the conference centre this morning I caught up with Jan Cilliers and UCT's Sue Harrison enjoying the beautiful view from the breakfast terrace. Sue is one of MEI's consultants to next year's Biohydromet '16 in Falmouth. The last day of the conference began with a keynote lecture from 2011 MEI Award recipient Peter Amelunxen, of Aminpro, Peru, who asked why, after more than 100 years of application of the flotation process, one of the most important technological advances in the history of extractive metallurgy, we still don’t have a standard test procedure for measuring the floatability of minerals in a given flotation system. Peter proposed that the challenges are essentailly practical. They include difficulties in quantifying, at the lab scale, the phenomena that occur in the plant; missing gaps in the phenomenological understanding of the flotation system; knowledge dissemination, particularly knowledge with respect to understanding and mitigating risk; budgetary constraints; and differences among the objectives of the various test alternatives. It is these challenges, along with the metallurgists’ desire to resolve them and get on with the job at hand, that have led to the differences in test procedures that we see in our community today. He explored some of the key issues that need to be resolved before we can hope to see universally accepted flotation test standards. Aminpro is a family business, and it was good to see Peter's father, Roger Amelunxen, making his first, but hopefully not last, appearance at an MEI conference. Two more papers from Chile and one from Australia took us to the coffee break, the final paper from Stuart Saich of Promet101 Consulting, Chile, discussing the efficiency in the design of large scale porphyry type copper concentrator flotation circuits in South America. 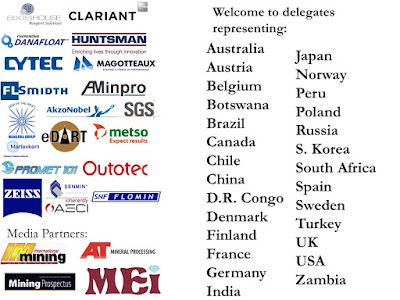 Conference sponsor Promet 101 is Chilean agent for Blue Cube Systems (Pty) Ltd of South Africa, a technology company focussed on real-time in-line instrumentation for the minerals processing industry. Following the coffee break, Ronel Kappes, of Newmont Mining Corp. USA, presented an interesting paper on a new flotation gas technology, using mixtures of CO2, N2 and air, for the treatment of low grade high carbonate auriferous pyrite ores. Lance Christodoulou, of Eriez Flotation Division, USA, then showed how the recovery of fine gold-copper particles could be improved by using enhanced column flotation. Cavitation® technology has been demonstrated to produce pico-bubbles which improve flotation response since it acts as a secondary collector enhancing bubble-particle attachment probability and reducing detachment. Results have shown that a column cell with a Cavitation® sparger can achieve a recovery of fine gold-copper particles over fifteen percentage points higher than in conventional cells. Outotec’s largest cell is the TankCell e500 with 500 m3 of flotation volume, and has been installed as the first cell in the Cu rougher line at Kevitsa Cu-Ni-PGE Concentrator in Finland. Toni Mattsson of Outotec reviewed in detail the measured gas dispersion properties of the cell, together with the metallurgical performance. Graeme Jameson discussed the fundamentals of fluidised bed flotation on Monday. Today Lance Christodoulou of Eriez Flotation Division, USA, showed how, over the last 15 years, this technology has been successfully applied to industrial minerals with several full-scale HydroFloat Separators installed to recover particles up to and exceeding 3 mm diameter. More recently, sulphide-based laboratory- and pilot-scale test work has shown that this novel approach is also capable of recovering the coarse metalliferous values that are typically lost using conventional techniques. The application of this technology was discussed by reviewing the data generated from test campaigns conducted on ore from two South American plants. In one case, coarse copper is recovered from a secondary grinding circuit. In the other, coarse tails generated by a centrifugal gravity separator is scavenged for the recovery of gold. The implications of properly applying this technology was also discussed. Fine particle recovery from waste streams is an ongoing processing challenge facing industry. Without an economical method of recovering fine coal particles from low grade and low pulp density feeds, industry has had little alternative but to accept a loss in recovery and discard such feeds. Jamie Dickinson, of the University of Newcastle, Australia, presented the first pilot plant investigation of a novel flotation device, the Reflux Flotation Cell, trialled using hydrocyclone overflow as the flotation feed at a coal handling and preparation plant located in the Hunter Valley, Australia. This system innovatively utilizes inclined channels to enhance bubble-liquid segregation, extending the hydrodynamic profile of flotation far beyond conventional systems. The results demonstrated a robust performance for treating challenging feeds. The morning session ended with a presentation from Juan Yianatos, of Santa Maria University, Chile, who discussed the development of a phenomenological model of a flotation process in an L-150 Jameson cell, in order to predict the metallurgical performance in a cleaner application. Last, but certainly not least, the conference ended this afternoon with 5 excellent papers on flotation cells. Erico Tabosa of Metso Process Technology and Innovation, Australia reminded us that flotation is not an energy intensive process and its optimization has traditionally been focused on recovery improvements, whilst comminution optimization has been focused on energy efficiency. However, in conventional flotation cells, the energy consumed by the impeller provides the basic requirements for flotation (air dispersion, solids suspension and particle-bubble collision). The distribution of turbulence and its effect on flotation kinetics have been investigated in a mechanical 3m³ flotation cell for a range of hydrodynamic conditions. The results show that flotation rate in the collection zone and the fraction of the cell with higher turbulence increases as more of the power drawn by the impeller is dissipated as shear in the impeller-stator region. Flotation cells are getting bigger and more efficient. This morning we heard about Outotec's largest cell, at 500m3. However, with an active volume of 660 m3, FLSmidth's new 600 series SuperCell flotation machine is the world's largest operating flotation cell and allows customers to take advantage of economies of scale (MEI Online). The FLSmidth 600 Series SuperCell, with half the number of flotation cells of smaller machines, offers a major advantage in terms of process control which facilitates more manageable control conditions on the plant. The improved control inevitably results in improved metallurgical performance, according to Dariusz Lelinski, flotation development manager at FLSmidth. With the growing need to optimise plants, this technology will allow additional rougher or cleaning capacity to be added to an existing circuit using a single 660 m3 cell. In this way the customer could easily increase the capacity or retention time of that particular row. The 600 Series SuperCells use the whole range of newly developed FLSmidth mechanisms: self-aspirated WEMCO® and the Dorr-Oliver® forced air mechanisms designed to float wide range of particle sizes. A model of the recently introduced nextSTEP™ rotor/stator combination was on display in the FLSmidth booth. But for how long will the FLSmidth cell have the honour of being the world's largest? Developments in large cell technology are also taking place in China, and the next paper, from Yeujun Zhang, of Beijing General Research Institute of Mining and Metallurgy (BGRIMM), the leading flotation technology supplier in Asia, described how scale-up of flotation cells has meant that the diameter and height of the tanks continue to be increased so that it becomes difficult to transport the mineral particles up to the middle and upper zones. Therefore, with the need to develop new impellers to improve the separation performances of flotation cells, a new type impeller, of which the disc section is a hyperbolic curve, namely a saddle-shaped impeller, has been designed. The effect of impeller shape on flotation performances in a 680 m3 KYF flotation cell has been studied by CFD. South African company Roytec has recently joined forces with BGRIMM to commercialise BGRIMM flotation technologies in Southern Africa. BGRIMM have recently been selected for the PMC L2 project in Phalaborwa; the largest of the cells will be 16 x 320m3 units with a unique backward swept rotor blade design, described in the poster session by Yuejun Zhang. Flash flotation cells are a common means of extracting valuable material from within the grinding circuit and are designed to process and upgrade cyclone underflow material. Sulphide minerals and precious metals may accumulate in the circulating load of milling circuits as a function of their specific gravity and without removal via a process such as flash flotation may be ground to very fine sizes (slimes) before they can exit via the cyclone overflow stream. The difficulties in recovering very fine mineral particles via ‘conventional’ flotation routes as well as the reduced capital and operating costs of a flash flotation machine make it an attractive unit operation in modern concentrators and Bianca Newcombe of OptiFroth Solutions Pty Ltd, Australia presented and discussed recommendations for operations utilising flash flotation. Flotation plays a relevant role in the concentration of iron ores and in the final paper, Antonio Peres of UFGM, Brazil, showed how pneumatic flotation technology has great potential for quartz reverse flotation in the iron ore industry, with the possibility of reducing the flotation time and increasing the metallic recovery. This brought an end to a fine 4-days of presentations, which were summed up by MEI Consultant Dee Bradshaw. After 6 years at the JKMRC, Dee has recently returned to the University of Cape Town as the South African Research Chair in Mineral Beneficiation, replacing J-P Franzidis who retired from this position in December 2014. Before closing the conference, MEI's Amanda announced the winners of the best student poster prizes, signed copies of the new 8th edition of Minerals Processing Technology, presented by the authors, Barry Wills and Jim Finch. The recipients were both from Australia, Yanhong Wang, of the University of Queensland, and Kaiqi Jiang of the University of Newcastle, and the judges were appropriately MEI Young Person's Award winners Liz Whiteman and Peter Amelunxen. Amanda then invited everyone to the farewell wine function in the gardens, and to Flotation '17, back at the Vineyard in 2 years time. A final thanks to all our sponsors for their support, and in particular to Axis House who have already signed up for Flotation '17. Thanks a lot for providing me such a prestigious opportunity of attending such conference at this young stage. I am just doing my bachelor degree and I got a chance to meet great people there and I will try my best to submit papers at your conference in future too. It was really a great experience to be there. Hi Rakesh, I just wanted to add that I too was very impressed to see the efforts you went to to attend the conference, and I'm glad that you found it worthwhile! Great conference Barry - excellent thought provoking keynotes, good range of research and practical/industrial papers, suitable break lengths for networking and viewing posters, well organised and managed at a stunning venue. Lived up to expectations and I really all aspects. I particularly like the frank opinions made by some experts on the present state of flotation in spite of so many papers over the years. Prof. Jan's remarks on modelling may bring a fresh approach(hopefully). Dr.Graeme's work on coarse particle flotation would be of great interest; I would like to know the coarsest particle floated and the mineral tried. On the whole the conference was reasonably good . . . The biggest problem I observed at the conference, and experienced as a speaker was the projector and the pointer. I think most presenters were challenged by the mouse as a pointer, and the device to move the slides forwards and backwards was less than adequate. There needs to be a significant upgrade of this equipment. I would imagine that I will not be the only person making comment on this front. Hi Chris, many thanks for bring this up, as the AVA facilities are of utmost importance to us. I am well aware of the problems associated with the mouse, and other problems with the AVA, and have drawn the attention of the AVA agent to these problems As a result of this we are assured that the system will be upgraded in time for Comminution '16. The incident with the remote mouse was unfortunate. We had both a mouse (to be used as a pointer) and a remote clicker (to change slides) at the lectern. Unfortunately there was not enough time for the IT technician to brief all presenters on how to correctly use the clicker and mouse, despite MEI having a notice on the board advising all presenters to see the technician well in advance of their presentation. The opening address by Barry Wills had quite a few slides with no problems but we did give Barry a full briefing beforehand. To overcome these issues occurring again, we will have a speakers preview area set up at future conferences, where presenters can go to amend, hand in presentations etc as well as be fully briefed on how to correctly use the upgraded equipment. We did not receive many presentations in advance this year (11 in total) which is always a concern. Most presentations were handed to the IT technician on USBs only minutes before the sessions started, not leaving time to brief the presenter. Organisation was perfect, despite the large number of partipants. Excellent papers in both symposia very well discussed by the participants. The number of participants who have attended all Flotation conferences was the same as in Flotation 2013: Jim, Dee, Stephen, Dan and myself. We all hope to be around within two years. Always good to see you Antonio. You must have attended more MEI Conferences than most over the years. Any idea how many? was a brilliant organization job that you did as usual. Thanks a lot. I appreciated the unique flair and great opportunity of open give and take among the memenbers of our flotation family. I look forward to our next Flotation gathering 2017 und the blue sky of Capetown. See you later, r.g.merker, MMP. Barry, I love your blog and how you have captured the 'intangibles' of the conference - the gathering of the 'Flotation Tribe' from various places in the global village. The biggest value of course is in the interactions and discussions that happen around the sessions. We are all participants and each contribute in a different ways to the conference - the level of engagement also determines what each person gets out of it . I think the challenge is to get more engagement into the sessions - some way of capturing the immense intellectual capital that is in the room in a more active way ... Maybe even some robust discussions or arguments - without diminishing the ambiance of the Vineyard hotel , wonderful activities and food outside the sessions that make MEI conferences as special as they are. Thanks Dee. You are one of the elite band who has attended all 7 of MEI's flotation conferences, and we greatly appreciate what you do to encourage young people to attend and present papers. Not sure how we can encourage people to engage more during the sessions, but there was very intensive discussion taking place during the long coffee and lunch breaks, and during the happy hours. I enjoyed the conference and I think it was well worth the time and cost it required for me to participate. Regarding the presentations, I found that there was a very good balance between theoretical topics and practical topics. This is very important to those of us who are involved in practice. At the same time, it was very difficult to find the purpose to some of the very theoretical presentations; the PEPT-based presentations, for example, I found to be very theoretical and the universities must begin to show that these research projects are useful to the practical engineer and not only curiosity-based research. I really enjoyed the dinner at Kirstenbosch gardens. The music was also very good but simply too loud and it was not possible to hold a fruitful discussion with other conference attendees during the dinner. This ruined the evening from a practical perspective because I couldnt hold the necessary discussions which I had planned. I personally found the informal meetings in the garden behind the hotel to be extremely useful. It was the best place to meet people and hold discussions without feeling pressure of "doing work". It was great and a very good idea!! Thanks Jacques. I am sorry that you found the live African music too loud at Kirstenbosch. I make no apologies for this, however, as the majority of the delegates seemed to enjoy the entertainment and many interacted with the dancers. I am surprised that you planned a business meeting during the dinner; the purpose of the visit to Kirstenbosch was to get away from the conference atmosphere for a few hours to relax and enjoy the food, wine, entertainment and general ambience. Pleased to hear that you enjoyed the happy hours, however, which are now a popular feature of the Vineyard conferences. As an newly incumbent to the MEI Family and my very 1st attendance at the Flotation conference as both Delegate and exhibitor, in my humble opinion (as I'm not a Metallurgist by qualification) I found the conference most enjoyable and certainly worthwhile. 1)Strategic intended beneficiation of low grade ore stockpiles and/or low grade sulphide/oxidised ore recoveries. 2)optimization of flotation processes by improved production methodologies. 3)Innovative reagent suite technologies with the focus on economic value add. 4)Predictive optimized quality control standards (these were some suggestions made to me by some of the Mining House Delegates that did attend). Just a thought Barry and I hope I'm not overstepping myself here but perhaps future MEI conferences might want to consider and propose an Agenda framework that is aimed at "point in time" market relevance and possibly request papers as such that will attract more Mining Companies & other vital industry stakeholders, over & above the very impressive show of Academic subject matter steered toward the "perfect mineral" per say. To conclude I would like to thank the entire MEI team for their warm friendliness and hospitality and for excellent Conference organization & structure. Look forward to the next one! Thanks for your valuable observations Neville. Unfortunately when times are bad, and they certainly are at the moment, it is difficult to persuade operators to attend conferences. MEI's events are not operators' conferences as such, we like a blend of industry, academia and manufacturers, but we would indeed like more operators. Even the operators' conferences are suffering in this respect, and at the recent SAG ‘15 conference, there was some concern that this event, essentially an operators' conference, was becoming too academic. There is no easy answer to this, but I do not want to go along the path of theming the next conference. It is a flotation conference, and I feel it should be open to all aspects of flotation, both fundamental and applied. Thanks for the comments Barry. 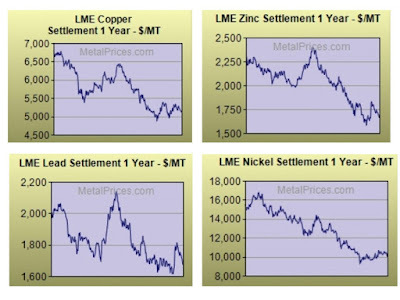 Perhaps "theming" as an adaptation to having an open forum for both fundamental and applied flotation metallurgy might not necessarily be a bad thing given the dynamics of the industry and the trends we see unfolding albeit cyclical perhaps. Operator adaptation to these dynamics is vital for survival and for sure operator expenditure budgets have been slashed to the bone and the motivation to attend will always be based on whether it's worthwhile to attend or not and/or where may deem pertinent based on what is to be presented. If I'm not mistaken, I think there are at least 6 Chemical reagent Suppliers that currently sponsor and exhibit and I'm pretty sure would like to see more operator engagement in between papers presented. As a poster submission, my comment is that unless there is actually a short snapshot presentation (5 mins) to advertise the work behind the poster, it is not worth having the posters displayed. With the display boards outside, and the tea/coffee inside where the exhibition booths were, there was very little interest in the posters. Also, it meant that the poster owners could not network during the morning coffee breaks as they were required to be on standby at the boards. As always, the venue was great in all other respects. Sorry to have to disagree with you on this Jenni. There were some excellent and important poster presentations and from what I could see, and from talking to other people, there was great interest in them, helped by the fact that this year we had a marquee which extended into the exhibit area. There was every opportunity for poster authors to network. They were asked to be near their posters at the beginning of the first coffee break, but after that there was certainly no requirement to be on standby. What was evident was that there was discussion during the coffee and lunch breaks (and the happy hours) and interested parties were then taken to the posters for further discussion. The conference was hold very successfully, and lots of researchers and engineers exchanged their research findings. I will also attend the Flotation 17 two years later. I am sorry, Dr. Zijie, that you and your colleagues had such a hard time obtaining visas. Issue of visas seems to be a completely arbitrary process, with some Chinese delegates having immense problems and others none at all. We now recommend for future conferences that you register as early as possible, and on receipt of registration we will issue you with all the information required by immigration. Unfortunately I could not attend my favorite subject FLOTATION. I presented my paper on low grade waste management in manganese mine having Mn <25% and innovate technology for producing value added products, in a seminar conducted by FIMI on 30th Nov and 1st DEC, at KOLKATTA. After visiting few Mn mines in INDIA balaghat returned on 13th DEC.
Good to know that you had nice time in developing Industries, Technology, R&D. Nice to see our great scientist Dr.Jameson Sir australias highly respected scientist. I am proud to be a mineral engineer contributing to National development in India and the world.